I wouldn’t be a historian if it weren’t for my disability. At the age of 12 I was diagnosed with a degenerative condition known as retinitis pigmentosa. 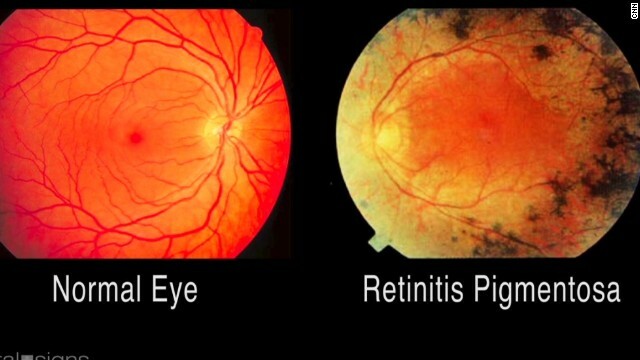 Retinitis pigmentosa is an inherited disorder caused by a gene mutation that makes the pigmented layer of cells in the retina malfunction so that dead rods and cones build up in the retina and keep new ones from taking their place. The result is gradual and largely unimpeded retinal cell death over the course of a person’s life. I may, at some unknown date in the future, be totally blind. But, retinitis pigmentosa is a highly individualized disorder that impacts everyone differently and proceeds at different paces depending on a nearly limitless variety of factors. In general terms, however, it always leads to the death of rod cells first. Because rod cells are largely responsible for peripheral and night vision, those abilities are most impacted in the disease’s earliest stages. As cell death progresses, however, it begins to affect cone cells, leading to impeded color and central vision. The human eye has a potential 180° field of vision. The average person has a slightly narrower field of vision at 120°. In order to qualify as legally blind, a person must have a field of vision of under 20°. I have 10°. As my condition has progressed and rod death has moved to cone death, I have completely lost the ability to see in the dark, my color vision has begun to fade, and my central vision has deteriorated to approximately 20/100 (objects 20 feet away appear to be 100 feet away). Before I was diagnosed, I had very different plans for my future. In elementary school, my only real physical issue was constantly tripping over my mother’s 150-pound mastiff, a source of frequent frustration for both my mother and her remarkably patient dog (although after the mystery of why it was happening was solved my mother’s frustration eased a bit, even if the dog’s didn’t). I loved playing sports (especially football), and hated school (even if I wasn’t terrible at it). My plan was to join the military (probably after reading one too many Tom Clancy novels) and become a police officer after I had finished my enlistment term (definitely after reading way too many Hardy Boy novels). My parents didn’t have a lot of money, something I couldn’t really ignore since we lived on a small, dilapidated farm—complete with a retired circus pony my father got by trading away a broken tractor and an even more dilapidated trailer with an Atari game system that my father found at a yard sale for me when I asked for a PlayStation he couldn’t possibly afford. I had little expectation that they would be able to afford a college education for me, and had even less interest in receiving one regardless. Even after I was diagnosed and my vision began to progressively worsen, I spent very little time considering the possibility of continuing my education after high school. Instead, in junior high I just spent a lot less time outside and a lot more time reading books (including during class, to my teachers’ exasperation). Even if I didn’t like school, I had always liked reading, and as a growing number of footballs, baseballs, and basketballs began to land in my face more often than they did my hands, I chose to retreat. Historical fiction was my favorite. Authors like Bernard Cornwell, Michael Curtis Ford, Colleen McCullough, and Conn Iggulden showed me worlds I could never possibly imagine, worlds that were as real as the one I wanted so desperately to return to but removed enough to filter out the physical and emotional pain it brought me. Where before history had been a general interest, by ninth grade it had become an obsession, and while my history teachers valiantly attempted to convince me to pursue that obsession after graduation I was determined to ignore them. All I wanted to do was get a job, any job, that would give me as much time to read as I wanted. Maybe I could even write some historical fiction of my own to go alongside all those Bernard Cornwells in my local library. Then I met this girl. She was smart, smarter than me, and even at fifteen she had her life together. By the time I realized she had her entire educational future mapped out from high school to grad school it was too late. I knew I wanted to spend the rest of my life with her (a knowledge I shared frequently to the accompaniment of my adult relatives’ patronizing chuckles). So, in the fall of my senior year I applied to my girlfriend’s college on early admission. It was the only school I applied to. I didn’t have any interest in going anywhere she wasn’t. When I got in, I was ecstatic. Then reality set in. The first year’s tuition was $27,000. Having a disability can often feel like generalized impostor syndrome, forcing me to doubt my ability to perform even minor tasks in my daily life. In a career field that can at times seem built deliberately to encourage that syndrome in its participants, I have little need for the pity and occasional outright dismissal of my peers to aggravate my own sense of inadequacy. Turns out, I was pretty lucky to be going to college in the twenty-first century and not the twentieth. Because disability activists fought for years to force the implementation of laws like the Individuals with Disabilities Education Act and the Americans with Disabilities Act in 1990, there were structural mechanisms in place to ensure that I received the same education as my peers and would be able to effectively navigate the world after graduation. So, I was able to qualify for an Individualized Education Program (IEP), an assessment of my needs as a student with a visual impairment. My IEP recommended that I establish a relationship with the Office of Blindness and Vocational Rehabilitation. My caseworkers there ensured that I received mobility training with and without a cane. They also provided me with assistive technology for free (including a special typewriter so that I could learn braille, which I never did, because I wasn’t really feeling it, duh dunk chh). Perhaps most importantly, however, they authorized funding to bridge the gap in my tuition after scholarships. All because people I didn’t know believed I should be able to succeed and fought for that belief for years before I was even born. 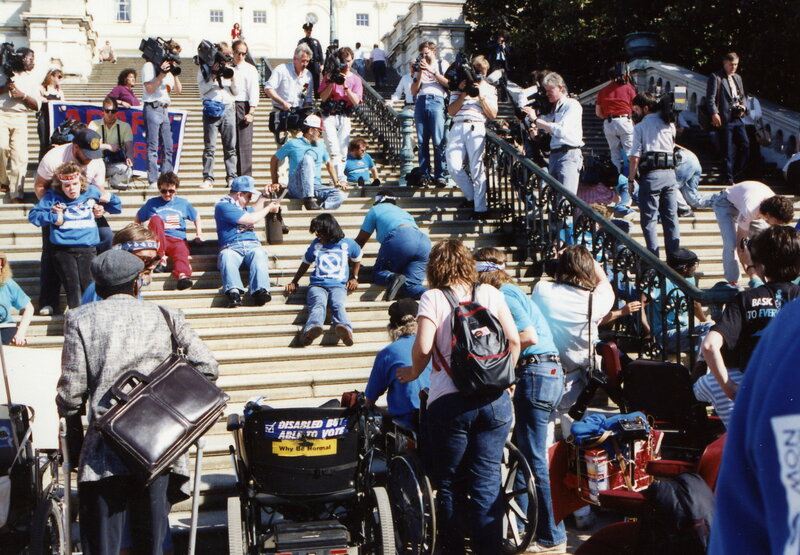 The “Capitol Crawl” protest in 1990, during which disability activists left their wheelchairs and crawled up the steps outside the Capitol Building. The ADA was passed shortly thereafter. Courtesy of VisualNews. Knowing that people I had never met had made my life better made me want to be that person for someone else. So, I entered college with an extra helping of the typical first-year’s desire to make a difference. Being a high school history teacher seemed to fit the bill perfectly, especially since it had been my own history teachers had made such a difference in my early life. Then I took part in my first education practicum. I loved teaching. What I did not love was teaching early morning classes. I learned later that visual impairments can cause sleep disorders like non-24. Because visually impaired eyes cannot properly absorb light, the body they’re attached to is unable to fully sense the separation between night and day and begins to sleep in a continuous, disjointed rhythm. Since childhood I had gone through cycles where I slept later and later each night until I wasn’t sleeping at all. Then the cycle would reset. The result? I was never much of a morning person. Unless you count angry, incoherent exhaustion as the hallmark of the typical morning person. After realizing I couldn’t teach high school, I went back to the drawing board. Again, it was my history teachers that made a difference. They convinced me that it was possible to pursue history as a career by other means, and constantly encouraged me along the way. They taught me how to successfully apply for the history research fellowship that turned into my senior thesis (where I met another historian with retinitis pigmentosa! ), and helped me get into a masters in history program at the school where my fiancée (née high school girlfriend) was getting her own masters. This time it was people I knew that made my life better, and I was determined to make their efforts mean something. So, here I am, writing for a website I helped to start that is specifically designed to use history for positive change. It’s a small step, but hopefully it’s a step in the right direction. But, my disability hasn’t just pushed me in this direction through happenstance; it’s also done so through circumstance. Because of my disability, I have been forced to think of social privilege in a way that I, as a white man, would most likely never have without it. Every time I step outside the home I’ve built to carefully cater to my needs in terms of navigation and safety I’m confronted with the reality of a world built for someone more physically able than I am. Store clerks have at times refused to accept my legal identification in lieu of a driver’s license for which I cannot qualify. When I reveal that I don’t have a driver’s license, the disbelief and occasional derision I am greeted with makes me feel like some sort of freakish curiosity (a feeling compounded by the fact that I was once literally called a “freak” for not have a license). In those moments, I can’t help but feel an internalized sense of shame that leaves me totally helpless. I used to report businesses that refused me service to the Department of Justice, and it was always gratifying to later return those businesses without further issue. Now, with an Attorney General that vocally opposed the very legislation that made my education possible, I can’t be sure that those businesses will be forced to follow the law, and my forays into the outside world have become even more complex and uncertain. Of course, the fact that I face issues on a daily basis for which I have few legal recourses exacerbates that uncertainty even further. For many, the downright travesty that is our nation’s public transportation system turns their daily commute into an exercise in extreme patience and planning. For me, it becomes an exercise in slow-motion acrobatics, the success of which can at times mean the difference between life and death. While public transportation gives me a level of independence I couldn’t hope to enjoy in the many areas in which it doesn’t exist, the designs of such systems often disregard the needs of passengers with disabilities. The DC Metro, which I use frequently, is a prime example of how structural privilege has impacted my commute. When the Metro system was designed in the 1970s, General Manager Jackson Graham was so opposed to the inclusion of elevators in stations for use by passengers with disabilities that he publicly staged a demonstration at Dulles Airport to prove that it was possible to navigate escalators in a wheelchair. Despite the fact that Graham was eventually overruled and elevators were included, evidence of his sometimes unintentional, sometimes deliberate disregard for the needs of passengers with disabilities remains. The honeycombed ceilings designed for noise reduction prevent light from reflecting off the walls and leave the large majority of stations in perpetual darkness, an issue made worse by the fact that many stations lack sufficient lighting fixtures. In many instances, I’ve been forced to move at a snail’s pace with my hands out in front of me to keep from running into everything in my path. Because no guardrails were put in place at the edge of the tracks, this means that the only thing standing between me and death on the rails is the hope that my feet will be sensitive enough through my shoes to feel the row of small bumps on the edge of the platform. This is all complicated by the sheer disregard many passengers have for others’ safety as they rush to their destinations. And, even when they don’t hamper my ability to navigate by pushing me out of the way, they treat my slow pace as a sign of stupidity, the humiliation of which often distracts me from the task of protecting myself. This constant series of dangers pushes my body’s threat response into overdrive, leaving my physically and mentally exhausted every time I leave a station. The business card I’ve started carrying around with me to give to people I run into. Even outside public transportation, where I can navigate with a bit more freedom, I am greeted with a constant stream of reproachful looks from the people I (literally) run into, exacerbating my humiliation even further. The end result is that I am reminded every single day that I am, at best, casually tolerated by the world I live in and, at worst, deliberately confined by it. We live in a society that incentivizes those with power to operate on the assumption that everyone else shares their experiences—an illusion of equality that allows them to live their lives with an artificially constructed sense of safety and comfort. Nothing quite makes that realization hit home like the moments that remind me that the ivory tower isn’t always as immune to those forces as its members often seem to think. Sometimes, it’s a small reminder, like the university shutting off all the lights in the stairwell before night classes are over to save money, or archivists greeting me with suspicion when I bring assistive devices into the reading room. Sometimes it’s bigger, like a senior scholar telling me that they don’t believe I can function as a historian if I lose my sight completely or outright refusing to believe I have a visual impairment at all because I still have limited sight. Because of such experiences, as my time in academia has passed, I have grown more and more wary of revealing my disability to my colleagues. Having a disability can often feel like generalized impostor syndrome, forcing me to doubt my ability to perform even minor tasks in my daily life. In a career field that can at times seem built deliberately to encourage that syndrome in its participants, I have little need for the pity and occasional outright dismissal of my peers to aggravate my own sense of inadequacy. The idea that I, or any other historian, is capable of “objective” research free from the bias of background is a farce. Our history isn’t what we make of it, it’s what we are made of. Still, most often, my issues in academia are systemic. The field of history offers little in the way of official mechanisms to teach me how to study and research given my specific needs. The few mechanisms that do exist are almost always exclusively for historians with disabilities that study disabilities (because what else could I possibly be interested in?). So, I’m left to my own devices, with my own devices, to learn through trial and error. No matter how exceptional my advisors are and have been (and they are and have been exceptional, I promise you), there is only so far they can travel with me on that journey without a foundation of shared experiences. Independent organizations do exist (I recently discovered Chronically Academic, a network of academics with disabilities and chronic conditions, which has already helped me in the short time I’ve known about it simply by existing as a resource). But such organizations are few and far between, and they can’t turn the tide alone. Universities, departments, and academic membership organizations need to put mechanisms in place that ensure scholars with disabilities have the resources they need to succeed. Implementing officially-sponsored mentorship programs so that established academics with disabilities can help early career scholars learn to navigate the ivory tower, providing large-print and audio editions of course materials at competitive prices, and arranging discounts for assistive technology would go a long way, as would any number of other solutions. In the meantime, I am forced to face the reality of my future as a scholar with a disability absent the structural means to achieve my goals. My experiences in and outside of academia have shown me the sheer depth at which the power structures that govern my life are entrenched, and have forced me to be cognizant of their long history. They have also forced me to acknowledge the power structures from which I continue to benefit, despite my disability. They have also driven me to better understand the long history those power structures share with the forces that sometimes make me feel powerless. The way that I have begun to study history in recent years, as a tool I might use to help dismantle structures of power, is a direct result of those experiences. The idea that I, or any other historian, is capable of “objective” research free from the bias of background is a farce. Our history isn’t what we make of it, it’s what we are made of. Historians that claim their work is blind to the biases of the world around them are simply choosing to close their eyes to the history of those biases. The result is scholarship that is sometimes twisted, and often cruel—a pale reflection of the cruel, twisted past it attempts to bring into focus. “Objective” historical research might be blind, but it’s certainly not blind in the way its adherents intend. Take it from me. I know a thing or two about being blind. Thanks for sharing! My son 25, & I have RP. Very encouraging.